Hors d’oeuvres at The Bourgeois Pig release. 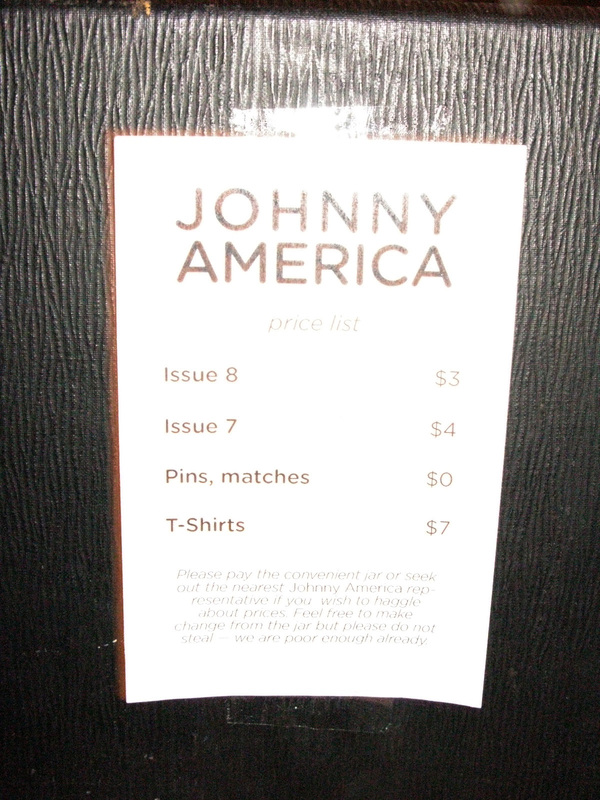 Price sheet for Johnny America merchandise. 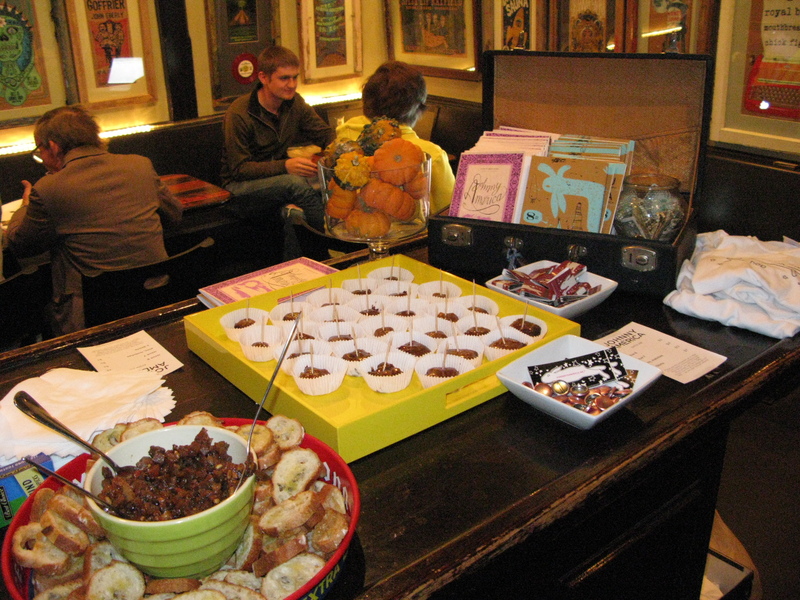 Thanks to everyone who showed up to The Bourgeois Pig last Saturday for our Lawrence issue eight release party. We’re having one more release, this time in Kansas City, our first release there. Hammerpress, creators of some of the nation’s finest letterpress ephemera (110 Southwest Boulevard, Kansas City, Missouri. www.hammerpress.net), are kind enough to host our issue eight release on Saturday, Nov. 20, from 5-7 p.m. We, co-editor Jonathan Holley and designer Patrick Giroux, will be whipping up hors d’oeuvres for the release, and quite possibly refreshments. This release is free, open to the public and is made possible with the support of the Rocket Grants. Come down and peruse the newest issue this Saturday! Also, if you care to make a day of it, earlier in the day at 1 p.m., the Paragraph Gallery at 23 East 12th Street, is hosting an artists/writers talk for their PAGES: Book as Medium, Catalyst, Venue show with readings from Tanya Hartman, Judith G Levy, Rob Hatem, Michael Krueger, Lee Piechocki (a fellow Rocket Grantee), Sean Starowitz, Luke Rocha, Stephen Proski, and Corinna West.